AUTUMN 2015: Following another dry few months this summer (despite plenty of rain) it has finally refilled and started flowing again. This has become so regular it really does seem like the flow is being stopped further upstream by causes unknown…. 04/08/14: ROCK BOTTOM! Seems to be an annual thing now…. 26/06/14: DOWN TO ITS MORE USUAL LEVEL of about 3 ins deep. 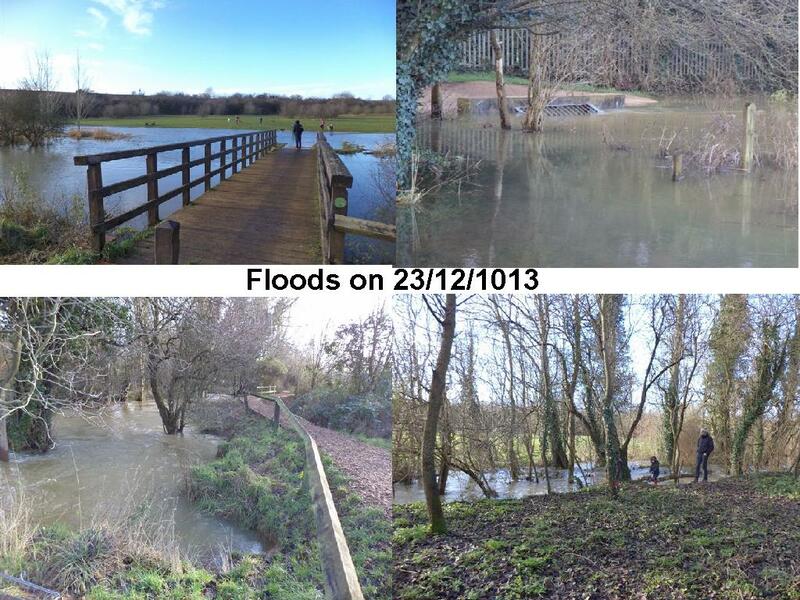 23/12/13: FULL TO OVERFLOWING! An attractive lake and river appeared overnight after storms, which also caused flooding in town. 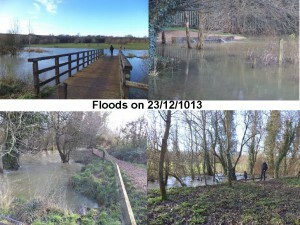 The bridge was impassable until late afternoon when the waters receded slightly. Swings and roundabouts – what a contrast to the summer! 22/10/13: THE BURE IS BACK! Thanks to all the rain, it seems to be flowing again at a depth of about 8 cms. JULY-SEPT: As has been reported in the press and seen by many a dog-walker, the Bure, which used to give the name of the town (Burcester) and flooded frequently into the floodplain of Slade Farm (Bure Park), is now tragically bone dry. According to the environment agency, this is because the source up near Bainton, has been affected by the very dry season this year, and the water table is very low. 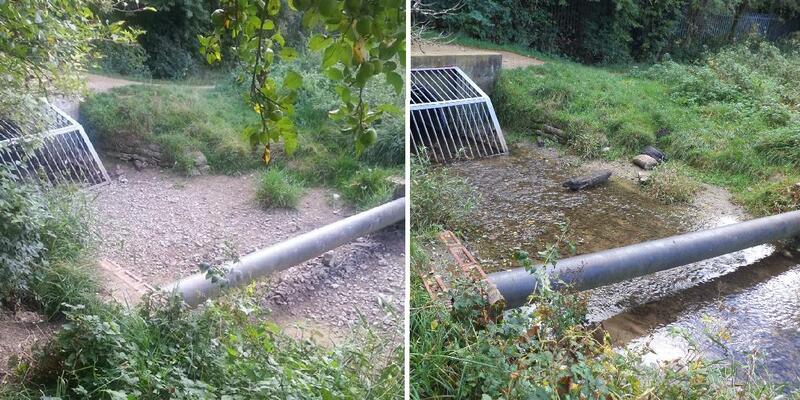 A dog-walker in Bure Park has heard that Tusmore Park uses water from the stream to fill its fishing lakes, so if their sluices were open this could have drained the stream, but there is no proof of this. However in most people’s living memory (including the summer of ’76?) it has never dried up. The flow resumes, thanks to another little spring, at the bridge under Hunt Close and into town, but even that is very low this year. So let’s hope and pray that it returns, otherwise the wildlife and geography of Bure Park and the town will be changed forever.